Now, I know this means a little something different for each person, but let's work together here. Regardless of what yours "looks like," everyone has an entryway of some sort. Go out your front door and shut it. Then walk back in. There - that is your entryway! Here is a picture of ours, looking towards the front door. And standing at the door looking in. Let's face it, for many people this is a problem area in their homes. Usually not because they have too much decorative stuff there, but because it is the first place they hit when they come home each day, often making it a dumping ground for STUFF. Because our family does not enter through the front door often, and I do not have a table in the entry to this house, it is a less of problem for us right now, but it IS still the first place people see when they walk in. And those half walls make a great place to make a stack- usually for mail going out! So here is your assignment- clear out and clean up! As usual, clear your space first! You know the drill by now. Start at the top - yep, those lights are dirty, I am sure of it. Wipe down any surfaces. If you have scuff marks from shoes on the walls and doors, the best thing I have found to use is a Magic Eraser. I do not want to know what is in those things, but they are truly magical. Even my all natural girl will break down and use them in a pinch! -Pay special attention to door handles, any glass in this area, and light switches. -Wax any furniture you may have in this area! My space is pretty small so we have no extra pieces here. I keep threatening to add a plant but it hasn't happened yet. You will only find two of my favorite pictures here but I did wipe them off! Given to us by dear friends upon our retirement, made by another sweet, and talented friend. Vacuum and wash any throw rugs. If you stop and think about how many shoes hit this area in one week alone, you might even decide to put this chore on a monthly rotation! We currently haven't decided if we want a rug in this area, so for now I am enjoying the tile. Wipe down the base boards. Again, magic erasers are great for scuff marks, just saying. 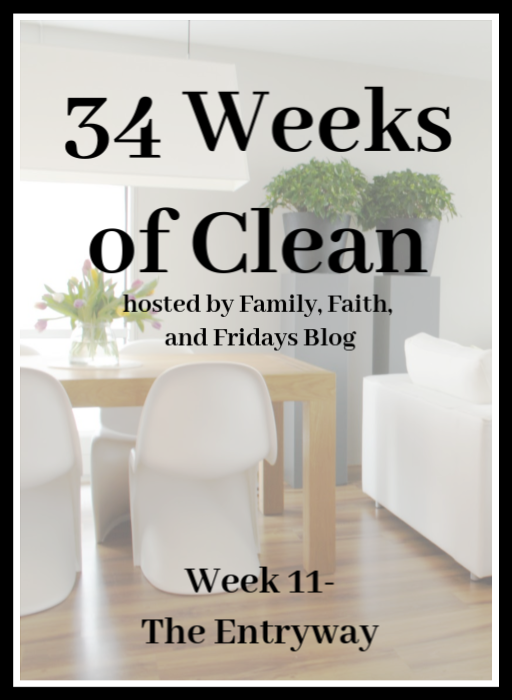 A word of caution- baseboards get dirty! After years of getting irritated every time I cleaned ours in the 34 Weeks process, I gave up and made it a part of my regular cleaning. No, I do not wipe them down weekly, but I do wipe them down once a month, usually the first week of the month so it is easy to remember. Vacuum and/or mop the floors. If you have windows in this area, clean those as well, remembering blinds and/or curtains! Now is your chance to really clean! Return do-dads to their spots. OK, only return HALF of your do-dads. Remember our goal of less clutter! My one do-dad in this space, but I love welcoming guests with a candle! DONE! Not too bad, huh? I hope this was a fairly easy week for you because, well, the next few weeks will be a challenge! Enjoy your lighter project and be ready to hit it hard next week! Nancy Twigg, "...clutter is anything that complicates your life and stands in the way of simplicity." hmmmm.... over-commitment, kids' activities, spending, emotions...you fill in the blank. 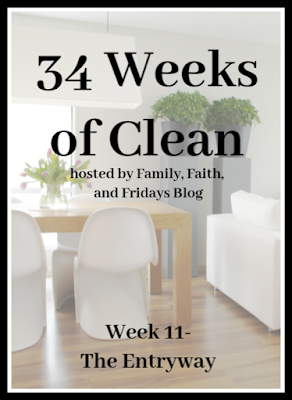 Nancy continues, "Clutter does more than affect us physically and emotionally; it affects us spiritually because it keeps us from following Jesus fully. We simply cannot make room for Him when so many other things are in the way." Ouch! Don't forget to share your progress on our Family, Faith and Fridays facebook page so we can cheer you on!